Pictured left to right are: Molly Dixon, Shannon Day, and Remy Zandier. Three Thomas Jefferson High School students were selected to participate in the Perry Initiative on Saturday, March 30, 2019 held at Carnegie Mellon University. The Perry Initiative is committed to inspiring young women to be leaders in the exciting fields of Orthopaedic Surgery and Engineering by running hands-on outreach programs across the country for female students in high school, college, and medical school. 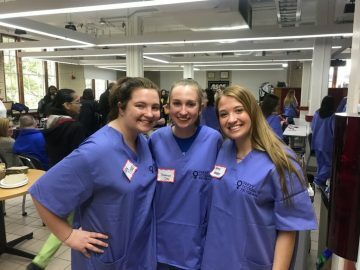 Based upon their online application and essay, Shannon Day, Molly Dixon and Remy Zandier were selected to take part in this enriching, day-long program which provides participants with the opportunity to perform mock orthopaedic surgeries and conduct biomechanical engineering experiments, while also hearing from prominent women engineers and surgeons in the field.